So it’s the first of the month and time to set up my April reading plan. My April reading plan is going to only include books that I need to read for book clubs and reads with my daughter. I am doing this to give myself some room to read anything else that I want to. 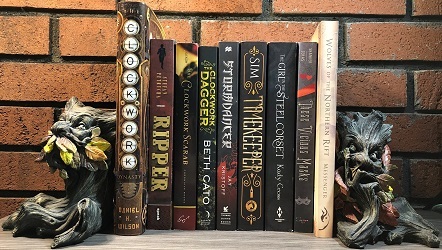 To be honest I could not pick which books I want to read and I found last month I wanted to read a bunch of books that I did not get to because I was so focused on reading what I put on my TBR. One good thing about having a teenager who loves to read is that we can read and talk about books. However, our focused genres are usually very different. My focus is fantasy where hers is contemporary but every now and then we find books that appeal to both of us. Our goal this year is to read one book each month, a short story from an anthology (we chose Because You Love to Hate Me) and to read a chunk of the Sherlock Holmes stories. First published in 1890, the second of Sir Arthur Conan Doyle’s Sherlock Holmes stories, The Sign of the Four is a classic of detective fiction and a forerunner of this now-ubiquitous genre. The story has everything – a beautiful damsel in distress, mysterious disappearances, a murder, a strange and lustrous pearl, a peculiar map, four desperate villains, an exotic treasure and, above it all, smiling superiorly as he moves with sure-footed confidence through the morass of conflicting clues, the inimitable Sherlock Holmes, investigator extraordinaire. I am hoping to participate in two book clubs this month The Name of The Book (https://twitter.com/NameOfTheBook) I will only be able to join the live streams for this one since it will be hosted in Australia. At the beginning of this year, some of my co-workers and I started a book club and our meeting for our second book will be on May 17th. We are meeting every two months due to all of us being busy and did not want to overwhelm ourselves, so I have until then to read it so I may or may not get to it this month but I wanted to add it anyway. I hope everyone has a great reading month.